This show began as a variety program that hosted both musicians and comedians alike. In fact when it started, some of the noteable guests included Morning Musume, Sonim, Moriyama Naotaro, ZONE and Ishii Tatsuya Ishii of Kome Kome Club. Half a year after it aired the program's focus shifted completely away from musicians/singers and went to comedians only. Comedians would appear on stage and perform a skit, switching to the next comedian afterward. 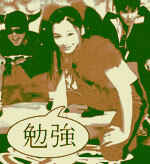 With comedians such as Jinnai Tomori and Anjasshu appearing, the program also became one on which primarily younger comedians appeared. It also served as a medium for other young comedians to get their big breaks, such as Hata Youku (Guitar Samurai). Sometimes special collaborations are even done between comedians, especially for this program. Over the years it has become one of the most highly rated weekly comedy programs, and any popular comedian (or one who wants to become popular) is almost guaranteed to appear on stage here.